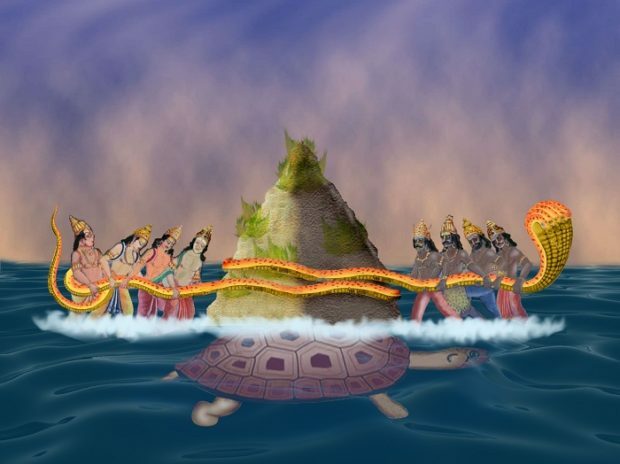 Kurma Avatar is the second incarnation of Lord Vishnu where he is said to have taken the form of a tortoise. During the Krita Yuga, there was a battle between Gods and Asuras (demons). The Gods had lost all their powers and might due to a curse by sage Durvasa. Once Sage Durvasa had presented a garland to the King of Devas, Indra. Indra who received the garland is said to have carelessly given to his white elephant Airavata. Airavata unknowingly trampled the garland under his legs. The sage who witnessed this scene felt humiliated. Out of anger, he cursed the gods which resulted in the Devas losing all their powers. The aggrieved Devas are said to have sought Lord Vishnu’s help, for which the Lord instructed them to churn the milky ocean using Mt Mandara. 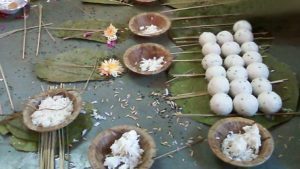 He also told them to seek the help of the Asuras in lifting the mammoth mountain, in exchange for a share of the Amirtha (nectar of immortality) that would arise from the churning. Hence the Devas and Asuras decided to churn the milky ocean using the serpent Vasuki as the rope. When they were about to begin, King Indra is said to have asked the Asuras for the head end of the serpent. But the Asuras suspected foul play and thus took the head end for themselves, giving the tail end to the Devas. This was, in fact, a trap laid for the Asuras, since the poison from Vasuki’s mouth was slowly weakening them. As the Devas and Asuras kept churning the mountain, it suddenly sank in. At that very moment, Lord Vishnu took the form of a tortoise (KURMA) and placed the mountain over his shell in order to keep it afloat. When the bowl of amrita, the nectar of immortality came out of the ocean, the greedy Asuras are said to have grabbed and ran with it. So, Lord Vishnu took the form of Mohini, a beautiful maiden, and seduced the Asuras. Mohini got the Amritha from the Asuras and discreetly distributed it entirely to the Devas, after which she disappeared. The Asuras were thus deceived, which gave the Devas the much-needed advantage over the Asuras to win the battle. 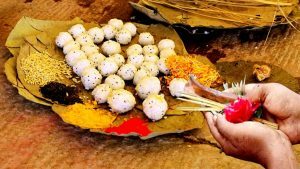 Know about Kurma Jayanthi, its rituals and benefits.